I’m in the middle of a top end on the 250 and when I spun the crank a few times I noticed this funny mark on it? It almost looks like a rusty residue. What can it be? Anything to worry about? It feels smooth. Bike has 75hrs on it. 2) What can it be? 3) Anything to worry about? 3) It can be if enough FeO2 comes off the crank bells and goes through the mains/big-end/wee-end. I thought you might know. Thanks Nutty. So what causes electrochemical dendritic growth? The surfaces feel like a baby’s bum. Should I do something, or just slap back together and keep riding? 1) what causes electrochemical dendritic growth? 2) Should I do something, or just slap back together and keep riding? 1) A combination of electrolytic action in the sump oil load, moisture and static charge. a) Don't restart the bike after washing unless you're prepared to ride it for at least 20 min. It's safer to do the filter and put it away cold. b) Use a FULL syn premix oil. c) Run a bond between the RHS crankcase half and battery negative. This phenomenon is common on methanol/castor bikes and oil-injected bikes, also under the roof paint on LWB vans. Use Motul 800T at 60:1 and it'll never happen. Ah that makes sense. 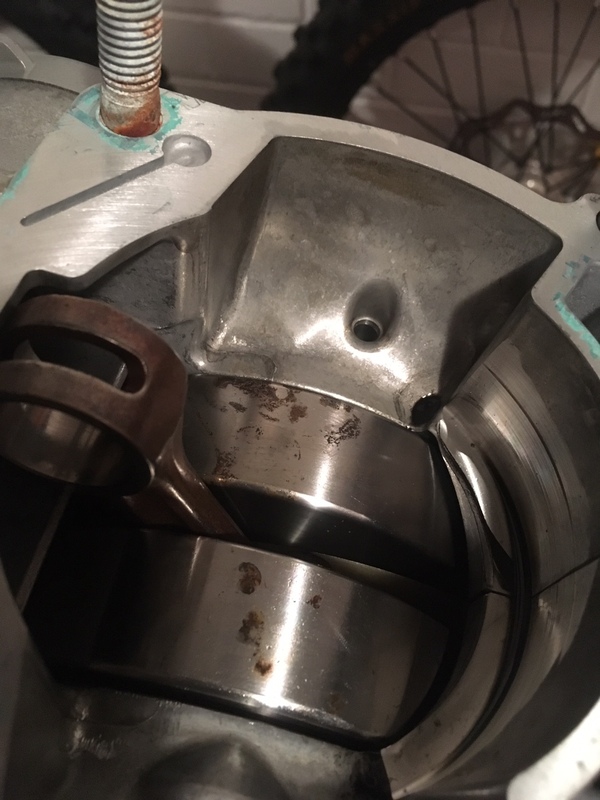 I got a little water in the gearbox filler point a while back when it came loose on a ride. After flushing the gearbox several times, I’ve noticed a little moisture in the breather hose of late. I recently bought some Castrol TTS as things are a little tight at the moment. It’s fully synthetic so hopefully it will be ok. Maybe if I win lotto I can afford the Motul - it’s almost double the price! But I know, you get what you pay for. Nothing wrong with TTS, it's as good as all the rest!